Aswani kijkt met zijn kritische blik naar de chaos en tegenstellingen in het alledaagse leven van het moderne Egypte. Een land dat worstelt met zijn identiteit, zowel in politiek als in sociaal en religeus opzicht. Eigen Vuur bevat de controversiële novelle Het Islam Abdelatiedossier, over een ontwikkelde man die dweept met het Westen en die verteerd wordt door de tirannie en corruptie in Egypte. 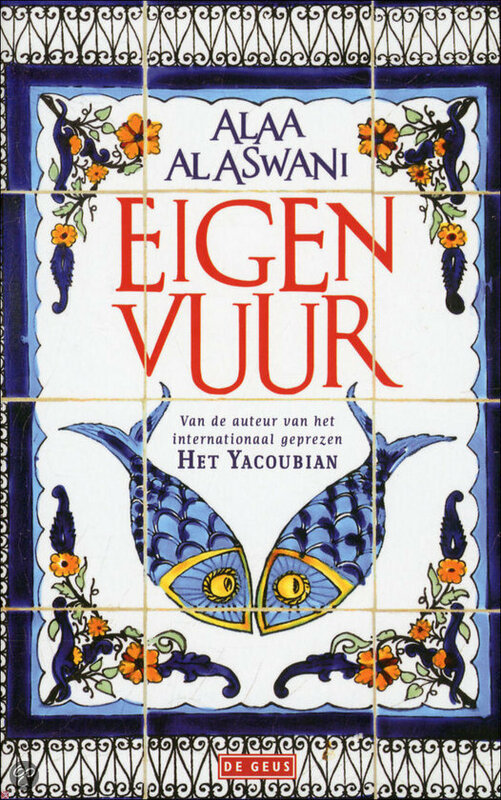 Deze novelle wordt al sinds tien jaar verboden door de Egyptische censuur. Aswany regards the chaos and the contradictions in everyday life in modern Egypt, critically. A country that struggles with its identity, politically, socially, and religiously. Friendly Fire contains the controversial novella The Isam Abd el-Ati Papers, which is about an educated man who adores the West and is torn by the tyrrany and corruption in Egypt. This novella has been banned for over ten years by Egypt’s censorship. This one, for me, started with the cover. Look at the gorgeous cover the Dutch translation has! It’s why it first caught my eye, and a big part of why I ended up buying it. Of course, it also helped that these were short stories about a complete different culture. One I hardly know anything about (unless you want to count the Western media, which I really don’t want to do). It contains several short stories, the first one The Isam Abd el-Ati Papers being the longest. Before that, it explains the struggle to get this first novella published, which meant dealing with censorship in Egypt. All of the stories are very beautifully written. I perhaps can’t speak for the original version (I cannot read Arabic), but the Dutch translation was amazing! It was at times almost poetic to read. Sometimes however, the point to the story is a little hard to understand (assuming there is one). The stories themselves, though the point might not be clear (to me) for all of them, are definitely great to read. There are so many different characters in these stories, some nice, some almost sadistic (Yes, I do mean the primary school children!). All of these different characters and the way the stories are told just bring up so many emotions. Some serious hatred, but also love, sadness, frustration, anxiety. Yep, I went through all the feels. Originally this book was written in Arabic, which I cannot read or speak. Therefore I read it in Dutch. However, according to Goodreads, it’s also been translated into English, and Danish.